This play is now available for licensing: email me via the *Contact* page. "Though the past haunt me as a spirit, I do not ask to forget." “The Chamber of Beheaded Queens” imagines what happens when Anne Boleyn, Mary Stuart, Catherine Howard and Marie-Antoinette are thrown together in the afterlife. Acrimoniously divided by unfinished business and still smouldering resentments from their time on Earth, can they find common ground and learn to live together in harmony? Anne Boleyn, second wife of Henry VIII, and Mary Stuart, Queen of Scots, share a chamber in the honeycomb of eternity where they bicker about things both epic and trivial. Disagreement about how to allocate the ten tokens they are given every century to spend for their comfort and pleasure opens old wounds. Clever Anne is still bitter about the manner of her demise and resents Mary banging on about her generations of royal descendants. Mary meanwhile is sulky and querulous, acting the martyr and needling Anne about her only daughter's role in her death. While preparing for the imminent arrival of Marie-Antoinette, Catherine Howard makes a surprise visit to Anne and Mary. Although she was the fifth queen of Henry VIII, she was never officially crowned and anointed and is thus excluded from the Chamber of Beheaded Queens. She begs to be allowed to transfer there from the foul Dungeon of Adulterers, where she is wretched. The encounter with both Catherine and Marie-Antoinette forces Anne and Mary to face unpalatable truths, but wrings out the best in them as they give comfort to two souls in torment. Their relationship will never be the same again. "LOVE shall be our token; love be yours and love be mine." ​From the moment 11-year-old KT rewrote William Shakespeare's 'A Midsummer Night's Dream' in "proper English", it was clear she would one day be a writer. She is fascinated by stories based on the lives of real people, true events and social turning points, as well as literary adaptations with a twist. In particular, she strives to give a voice to women and other maginalised groups. Recently KT won the period/historical feature-film category of top US screenwriting competition Final Draft "Big Break" (2015) and has won or placed in numerous other screenwriting contests. 'The Chamber Of Beheaded Queens' is her first play. When I was nine years old, my mother bought a biography of Elizabeth I. That book changed my life. Attracted by the stunning portrait of Elizabeth as a young princess, aged about thirteen, I did my best to plough through a historical biography whose vocabulary was beyond me. Though allusions to "windows in men's souls" passed over my head, I was so impressed by the extent of Princess Elizabeth's learning and fluency in several languages, that I determined to be just like her. Seeing my obsession, my mother gifted me the book. I have it still, my childish signature laying claim to it on the title page. 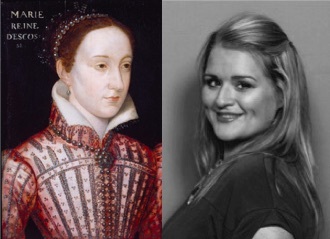 It was inevitable that my interest in Queen Elizabeth would eventually extend to her mesmerising mother, Anne Boleyn, her young step-mother, Catherine Howard, and her tragic cousin, Mary Stuart. Indeed, history itself became a passion and as I attained fluency in other languages, so that passion spread to the history of other lands and the stories of their famous women too. Marie-Antionette's story revealed to me how absurdly reductive, unjust and inaccurate "popular" history can be, particularly in respect of women. 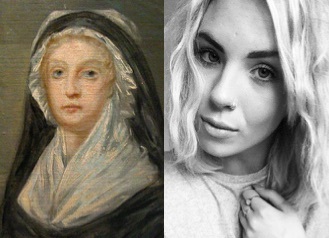 Often the calumnies heaped upon female historical figures overtake the facts, until our portrait of them is varnished with lies spread by their detractors - a varnish that thickens, hardens and yellows with time. In The Chamber Of Beheaded Queens I wanted to peek behind some of the popular tropes of these four famous queens to find the forgotten woman who lived, loved, suffered and died in such gruesome circumstances. I wished to remind the audience of the injustice they endured, help my characters find a way through it and reveal their humanity. The starting point for each of my queens is their popular stereotype, giving rise to conflict between them, but allowing the play to begin in humorous vein. Anne and Mary, bursting with pride in the accomplishments of their respective children, snipe at each other like two rival mums waiting outside the school gates for their progeny. With the arrival of Marie-Antionette in a state of post-traumatic stress, the tone of the play shifts. It is as a result of their interaction with her that the other queens, including by now giddy Catherine Howard, learn to set aside their differences when they share the details of their respective ordeals with one another. The solution, then, to overcoming the pain of the injustices they have suffered involves sharing, solidarity and sympathy. ​Kate has directed a variety of plays over the years at colleges/universities and in local drama groups around the North-West, from 'Macbeth', 'Julius Caesar', 'Measure for Measure' and 'The Taming of the Shrew' to more modern dramas such as 'Death And The Maiden', 'The Thirty-Nine Steps', 'California Suite', 'Oh, What A Lovely War' and 'Educating Rita'. Kate has also acted in Shakespeare, Beckett and Chekhov as well as memorizing a whole text whilst cooking egg and chips when she played Shirley Valentine in 2008! 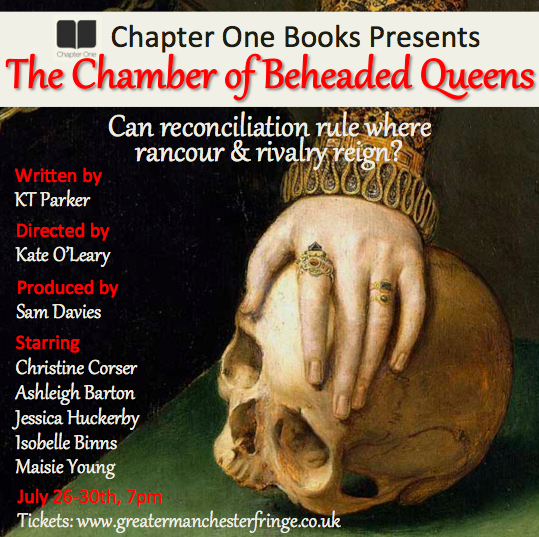 The Chamber of Beheaded Queens is a play about transformation. In an imagined after-life, the bitter squabbles of Anne Boleyn and Mary, Queen of Scots, and the petulance of Catherine Howard are brought into relief when Marie-Antoinette makes an emotional entrance to join them in their endless world. All quarrels are set aside when confronted by memories of their own executions and the wrongs done to them by those more powerful than they. My cast and I are honoured to bring to life KT Parker’s important and timely play that takes a fresh look at the plight of these women at the mercy of their historical moment. "Alas, we are done with time. Or time is done with us." Christine graduated from The Court Theatre Training company in 2014. Most recent credits include Princess Jasmine in 'Aladdin' for Gary Starr Productions, Hera/ Mum/ Janice in 'Deal Or No Deal' for Glitch Theatre and 'A Wartime Majorette' for Dreamworldwide. She also co-produces and performs at The Spare Rib burlesque and cabaret nights. 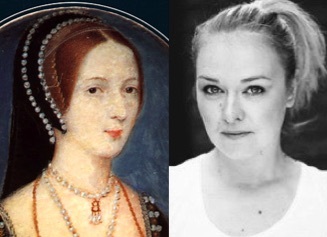 She has always felt a strong pull towards the role of Anne Boleyn and is really excited to be part of this funny and moving play. "By giving place to love in our hearts we found our heads again." Ashleigh has been actively performing in amateur theatre since the age of 13. After leaving sixth form with a drama A-level, she forged a career as a successful professional vocalist, singing at venues across the North West and North Wales. Ashleigh is a member of local theatre company Wildflowers Productions, whose latest production 'The Morgue Table' has just completed it's third successful outing following performances at the Epstein and Unity theatres. "No one understands my ills who does not know the heart of a mother." Jessica Huckerby has recently graduated from Liverpool John Moores University with a B.A Honours in Drama. Her most recent productions include 'Posh', in which she played the lead role of Alistair, and 'The Acid Test' by Anya Reiss, part of Liverpool's Young Everyman Playhouse (YEP) Directors' Festival. She also has a lot of background television experience, Including a role as Ricky Tomlinson's daughter in the recent production of 'Gloves Off'. "Can I ever be other than as I am?" Maisie is a graduate of the Liverpool Institute for Performing Arts. This year she has appeared in ‘Sense & Sensibility’ and the world premiere of ‘Who's Afraid of the Working Class?’. Maisie is a founder member of the new Laughing Stock Theatre Company which performed Greek comedy 'Festival Time' at the Liverpool Playhouse Theatre in May. She also recently appeared in 'The Effect' by Lucie Prebble as part of Liverpool's Young Everyman Playhouse (YEP) Directors' Festival. "Death is not the worst thing that can happen to a woman." Isobelle has completed her first year at Liverpool John Moores University where she is studying Fashion Communication, but hopes to pursue a career in acting after she finishes her studies. She currently trains at The Merseyside Academy of Drama, where she attends weekly acting for camera classes. She has recently taken a TV presenting course at the TV training Academy in Manchester. Our Manc Mini series offers short, witty and slightly tongue-in-cheek insights into the offerings at the North West’s largest arts festival. “The Chamber of Beheaded Queens” imagines what happens when Anne Boleyn, Mary Stuart, Catherine Howard and Marie-Antoinette are thrown together in the afterlife. The play is now available for licensing: email me via the *Contact* page.